Build Up Design was established by Simon Scally in 1992. 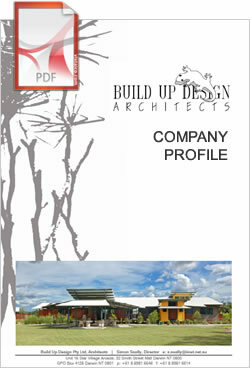 It is a registered Architectural Company and our office is located in Darwin. We have been operating all around the Northern Territory for 20 years providing Architectural and Project Management services for private and government projects. Build Up Design approaches each project as a new design exercise that requires a fresh perspective and an open mind. Our approach is to research the project parameters, site context, landscape, services, budget and regulations. We work with our clients to explore and define their requirements. Inspiration is drawn from a wide variety of sources including research into our clients’ interests, review of exceptional examples of the proposed building type and response to climate, site context and landscape. We fuse creative experimentation with technical knowledge to come up with innovative yet practical solutions. Professional experience in housing, health buildings, schools, offices and infrastructure. In depth understanding of remote area design and construction issues. Commitment to community visions through long term working associations with local communities and organisations. Established working relationships with local authorities as well as broad ranging experience and understanding of specific statutory requirements. In depth understanding of the local construction industry and associated building issues specific to Darwin and the Northern Territory. Quality assurance systems and client reporting procedures that ensure a high degree of cost control and accountability from sketch design to project completion. "Build Up Design approaches each project as a new design exercise that requires a fresh perspective and an open mind."